The BLAUVELT YARD SALE happens at homes all over Blauvelt on a Saturday and Sunday in May, from 9am to 4pm. Individual home's hours may vary -- some have abbreviated hours, some do their sale only on Saturday or Sunday. There is no rain date, and residents are free to cancel an individual sale at any time. We try to avoid dates on which competing events are scheduled at local churches and civic groups, so we pick the most “available” weekend in May and announce it in our Spring newsletter, out on March 1. This event usually features 30 locations or more in Blauvelt. Each home displays a teal and orange BLAUVELT YARD SALE lawn sign in front of their house. 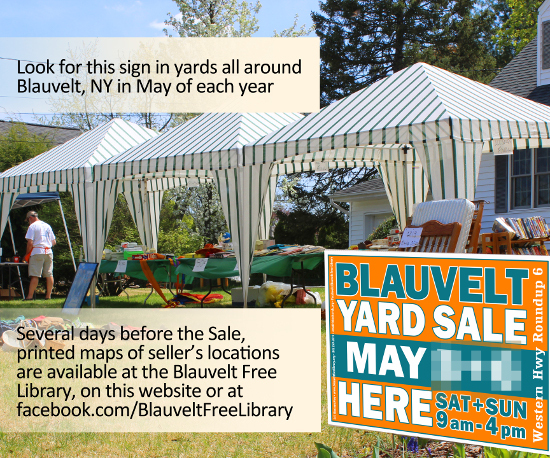 Sale locations are easily found with the YARD SALE TREASURE MAP produced by Blauvelt Free Library and available on May 1st online at > blauveltfreelibrary.org or in print at the Library, located at 541 Western Highway in Blauvelt. The map has dots where the houses are located, along with the addresses. On the reverse is a merchandise listing. Sellers tell us about the type of stuff they have to sell, so you can work out a route that gets you to the ones most likely to offer what you want. Blauvelt is under 5 square miles, so you should be able to cruise the sales over the course of a day. Sale locations are easily found with the YARD SALE TREASURE MAP produced by Blauvelt Free Library and available on this website several days before the sale or in print at the Library, located at 541 Western Highway, Blauvelt. Later versions of the map supersede the initial printing, but it can still be used to plan a route in advance for out of towners. We locate an outdoor map display by our front door on Friday night, previous, so the maps can be retrieved 24/7 during Yard Sale Weekend. The most up-to-date version online is always found on our Facebook page, revised to the minute, at https://www.facebook.com/BlauveltFreeLibrary. The map has dots and addresses where the houses are located. On the reverse there’s a merchandise listing gleaned from information collected from sellers about the type of stuff they have to sell, so you can work out a route that gets you to the ones most likely to offer what you want. Blauvelt has an area of under 5 square miles, So navigating it is quick, despite the sometimes gerrymandering road network. Each year, Blauvelt residents are encouraged to call, email or stop by the library to register after March 1. Participation is free. They get a lawn sign, a sales kit and benefit from online and print advertising throughout the Hudson Valley. We advertise in newspapers, on yard sale sites, and on tag sale Facebook pages within a 100 mile radius from Blauvelt. In addition, the library can help a Blauvelt resident promote an individual yard sale anytime during the year, utilizing our email and Facebook reach. Call Barry at 845 359-2811 for more information. Meet Blauvelt's own pet pig when he comes to visit the library for a meet-and-greet! Six years ago, a foursome made up of the leaders of each section of the Westchester Chordsmen, a "barbershop" chorus from the other side of the Hudson came together as a quartet called, "Main Ingredients" to perform a Valentine concert at the library. We liked them so much that we asked them back for a St. Patrick's Day show the next year. They had never been asked to do such a program, but were up for the challenge of creating one, so they mixed beloved ditties from the Green Holiday with American Songbook selections to make a great show. We decided to email their leader, Chet, to offer them a slot if they would reprise the concert this year. He said, "Sure! In fact, I've got a new quartet, and they are even better than the last one!" The new barbershop quartet is named, "RSVP". The concert is FREE, with Irish-themed sweets to nosh on. "Barbershop" singing is a style of very close harmony in which the first tenor often sings higher notes than the lead tenor. It's characterized by a minimum of vibrato in the delivery, resulting in clear, brassy chords. The lore tells of groups that evolved from pals who hung around the local barbershop in "olden times", and dress often refers to music hall costumery of the late 1890s-into-1900s, such as brightly striped summer blazers (perfect for romantic spooning), loud vests, bow ties and "straw boaters"--flat-topped, flat brimmed straw hats that businessmen wore in the summertime. Create an original masterpiece from assorted materials! For kids and adults. Storycraft cottage | Drop-in from 6 - 7:30pm. Meet some animals who use rocks for protection! Colorful fun for the whole family! Play games and puzzles with your young ones! Play board games, cards, puzzles or chess with your kids, grandkids or friends. Singles welcome, too!